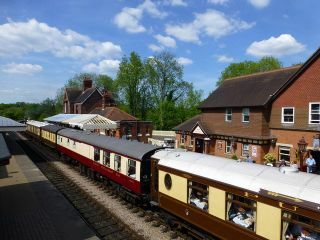 The Bluebell Railway was the nation's first standard gauge passenger railway to be preserved for pleasure use. The railway runs on sections of the old rail line between Sheffield Park and Horstead Keynes, on the Lewes to East Grinstead line. In addition to running regular journeys for visitors, the railway acts to preserve historic steam and diesel engines and railroad equipment such as signalling gear. There are regular steam engine trips, and special seasonal events such as Santa Specials and Summer Fun days. Visitors can also purchase a joint ticket for the railway and the National Trust property of Sheffield Park Garden, which is joined to the railway by a short (1/2 mile) footpath.